Victoria Hall, Keighley – 24th to 31st January 2015. It’s Panto time again… Oh yes it is! Continuing our fine tradition of high quality fun filled family pantomimes we present “Cinderella”, 24th – 31st January 2015. This year’s pantomime is going to be a treat for the entire family. Written by the kings of panto, Keith Marsden and the late Geoffrey Rundle, we take you to the town of Stonybroke where we find the Baron and his daughter Cinderella. It’s not enough that Cinderella is picked on by her Ugly stepsisters, Deidre and Josephine, but the nasty debt collectors, Snatchem and Grabbem are never far away. Cinderella promises to be a fresh and fun family pantomime full of well loved songs and tradition. The show will this year be directed by Peter Whitley and Judith Chapman. Judith will also be choreographing the cast of over 40 people. Musical direction from John Sandland – completes the winning team! Leading the talented cast is Stephanie Laycock as Prince Charming, Brogan Hollindrake as Cinderella, Philip Smith as buttons. We of course have yet another talented team of kiddies and first time KAODS appearances for Paul Bamber and Paul Jennings, as the ugly step-sisters. 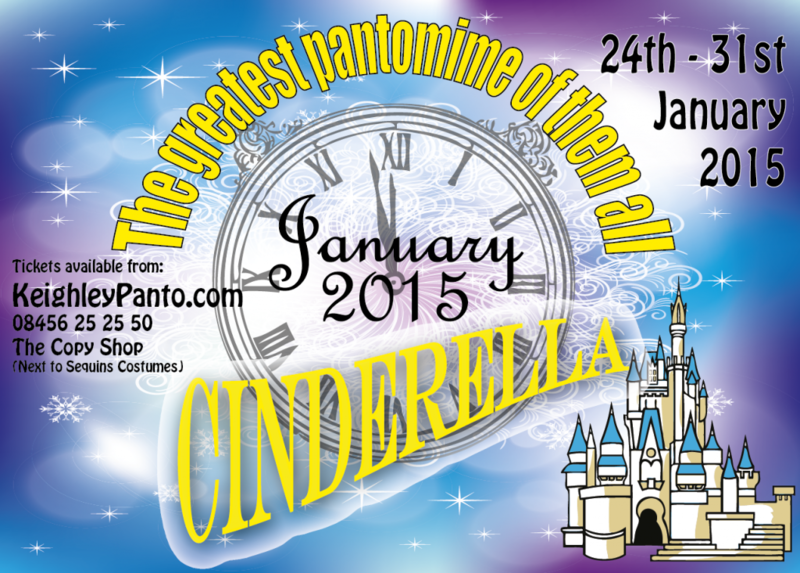 If there is one pantomime you see this year then it has to be Cinderella! It’s easy to buy tickets! It’s now also easier than ever to book online at www.keighleyamateurs.com – you can choose your seats and pay by credit or debit cards. Tickets go on general sale from the 1st December 2014 so before that time you can bag the best seats by using this priority booking form. You can of course book at anytime subject to ticket availability. Please bear in mind that in the past some performances have sold out very quickly. As usual, a 10% discount applies to all bookings of ten or more tickets to a single performance, so bring along your whole family.